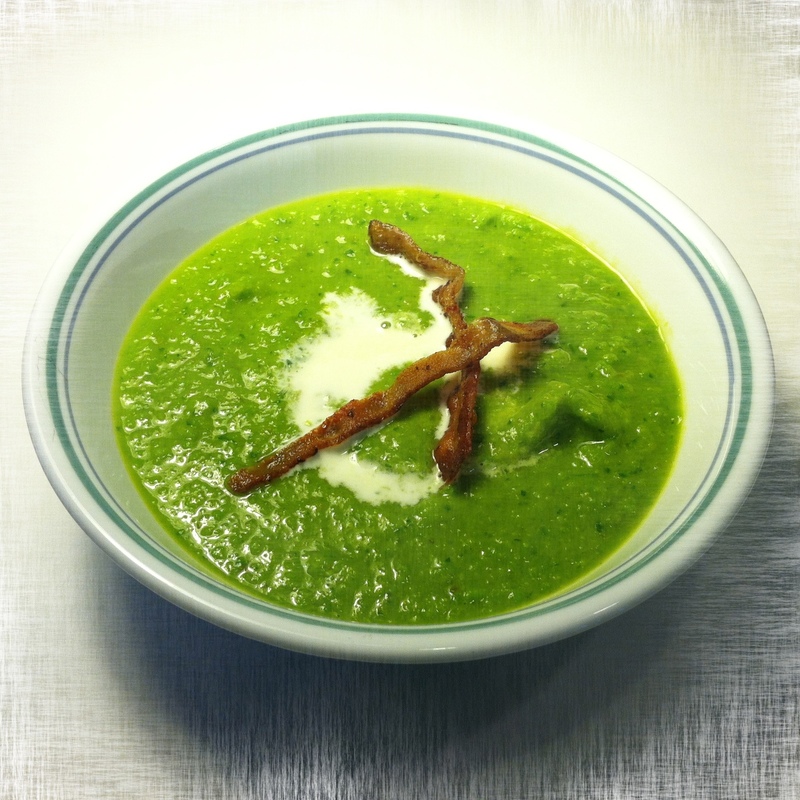 Chilled Pea Soup | Eat More Plants. I adapted this recipe from my favorite Food & Wine cookbook for 2009. It was originally a Daniel Boulud recipe. I highly recommend buying or borrowing a copy of each years annual F&W cookbook because the recipes are amazing. The best of the best! In the same pot, heat the oil. Add celery, onion and leek. Cook over low heat until softened but not browned. Add the stock, 4 slices of cooked bacon, 1 sprig of rosemary and a pinch of each salt and pepper. Simmer until the veggies are very tender, about 15-20 minutes. Discard the bacon and rosemary. Use a slotted spoon to transfer the veggies to a blender. Save the broth. Pour the 2 bags of frozen peas into the broth and simmer for 3 to 5 minutes, just to heat them through. Put the parsley into the blender on top of your veggies and then using the slotted spoon again add the cooked peas to the blender. Purée until smooth adding as much broth at a time as needed. Transfer the soup into a bowl sitting in a larger bowl of ice water. Mix in another few ladles of broth. Leave it to chill for at least 20 minutes. In the meantime, bring the heavy cream, garlic and remaining sprig of rosemary to a low boil. Immediately bring the heat down to a simmer and let it cook for about 5 minutes. Strain the cream mixture and let it cool. Ladle the chilled soup into bowls, drizzle with the cream sauce and finish with some of the remaining bacon crumbled on top. Yum! Beautiful soup for summer.